my Version of the Home Market is (very) slowly getting Shape and i think it's ready for first Preview. The Box on the roof isnt final, but the Building itself pretty much is. Other Boxes are just Placeholders for future Vehicles. 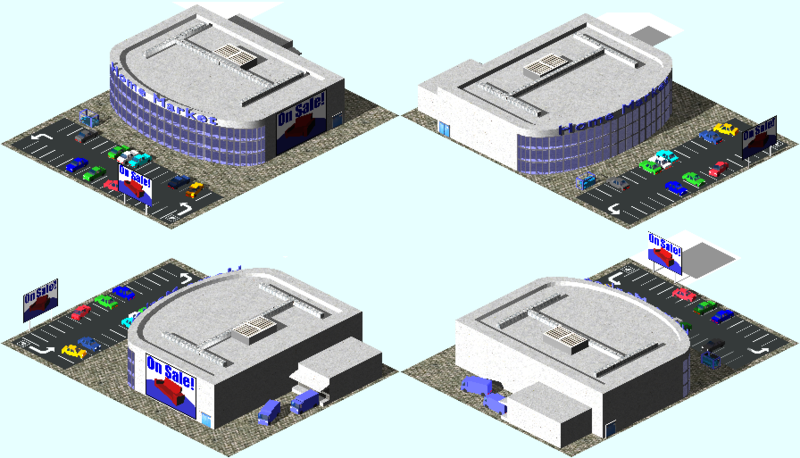 Behind the Building i will (probably) build a few Loading Bays for Trucks and a few Doors + Stairs, not sure yet. i would exclude pavement and roads from 3D modelling. Pavement would look better if we used the standard one (more consistency). Similarily, roads should rather use standard pavement&stripes (or better, with VS's consent, those i'm preparing for a complete replacement. I could provide you with both, if needed. Those could be added in a second time, or used as a texture (I have NO idea how to work in 3D). Well, replacing the Textures of the roads is pretty easy, I'd just need a rectangular picture for that. 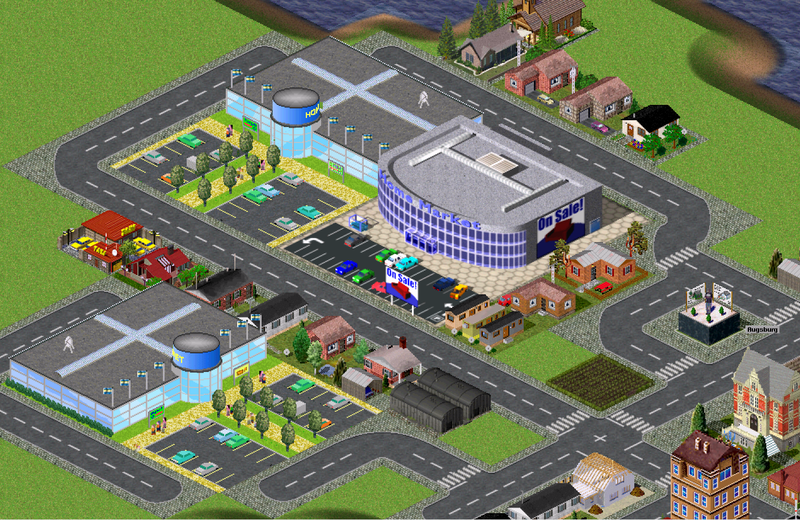 I was thinking about removing the Roads myself, - they take way to much place. I thought it would look kinda stupid if i dont connect the Parking and the loading areas to Roads. Oh, and 3D isnt all that hard, - my entire Knowledge about Blender (and that's just basics of modelling and texturing) is not older than 1 Month. nice! i'll provide you also with the texture for asphalt, if you're interested. Thanks. I think I'll forget the roads alltogether, there is not much place for them. I'm not sure about many things, it's my second Building after all. Was hoping for more than every 100th Viewer to post some sort of comment and help with my Decisions, oh well..
Edit: @MHD I tried to make that Shopping Cart Housing and actually modeled a bunch of those Carts inside of it, but it's really hard to see on the Image. Thanks for Ideas anyway. simple looking, but very pleasant to look at. nice work. Uh, guess I misunderstood you. I thought you were speaking about road-textures. I'll take any help i can get. So, if you still like to share the textures i'll take them with thanks. So, I've learned and used a few more Things about Texturing. 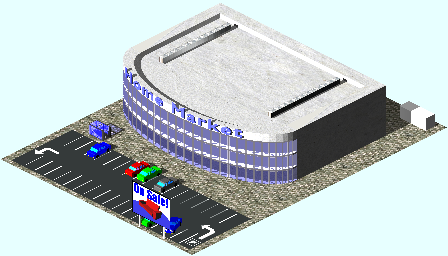 CityCars look better now, Shoppingcart Housing still dont. Almost done now, here is 3rd Preview(444kB): http://gouv.de/ext/simutrans/hm_1.png. So, I think there is still some tweaking to do on the Trucks, anything else? Oh and that white rectangular Tile above the Building will be gone in the final picture. a) Plan, composition, layout... call it what you want. Perfect. It does not feel empty anywhere. d) Textures are... ummm... less wow and more uhm. I'm not sure what is the cause with building, especially roof. First instinct was to call it too grainy, but on a second thought it might be just that it has exactly the same colour as walls. When you think about that... it makes it look somewhat like a brick of paper. Second, pavement. I know it will look different with render settings (see below), but currently it looks just like blurred and rotated standard pavement texture. Both changes for worse. The result has strange "direction" and given the size of visible bumps, used tiles are at least as big as a chair. This, too might help the scale concern. e) Render. I'm sure this is a quickie preview, but the adjectives it immediately brings to mind is "particularly ugly". I couldn't identify that... stupid of me It has a really strong "ancient computer" feeling to it, incredibly pixelated and palettized. I'm sure nicer looks are in this case just a few button clicks away, for starters you could turn on some kind of antialiasing. I am sure Zeno, vilvoh or The Hood could help there. Look at car windows, particularly the yellow one shows these shortcomings in side views. Btw, given what aliasing does, maybe just switching it on will save looks of the pavement, as is. PS: I'm sorry if it's too much negative feedback at once, but I just want to help... Even if this is a lot of text, actually fixing the issues (at least some) should be straightforward. Guess you're right, I didnt realise that prior to posting. Building itself (and thats a major part of the Image) is textured with real Concrete-Texture and it's, well, grey.. Maybe to realistic in this case. Additionally, Shadows were to dark, so I added extra Light from the East. The Walls/Roof of the Building are completely textured with that Concrete Image mentioned above. 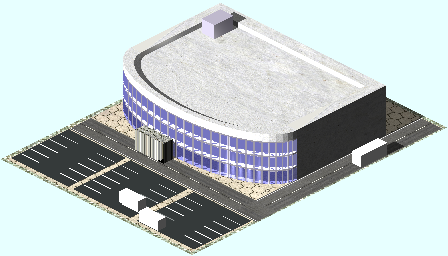 I dont know what material/color Roof should have? Switched Pavement back to my stone Plates. The other Texture was of wrong size and was anything but good, thats right. Entrance still cant be identified, gotta put something in front of it. Well, I did read in some sort of Blender-for-Simutrans Tutorial, that Oversampling makes the image and especially the edges to blurry and should be turned off. It has been off ever since. Oversampling in Blender can only be put on or off for everything. But after some searching i found a way to keep OSA on without getting the Tile-Edges blurry: Link. Ah, and here is the new Version with OSA on: Image. I really like the latest version, the textures are soft and the glass fachade looks great but be carefull with OSA, it blurs the edges. 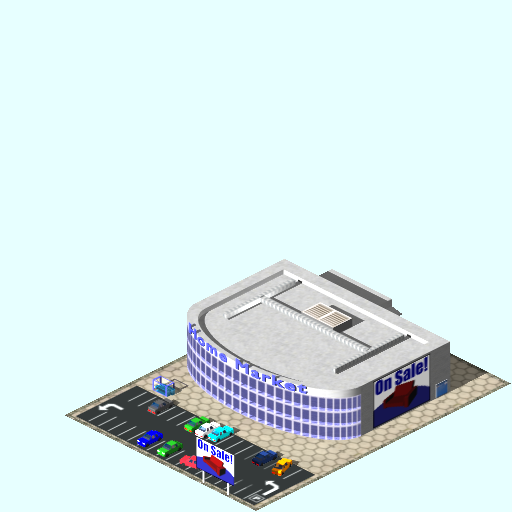 Minor Update: added Entrance and let some lazy Simuworkers repaint the Walls. The new 'Color'(it's still Concrete-Texture, just tweaked a little) made my Glass-Panels darker again, d'oh..
@vilvoh I know, it's already blurry for my taste. Those tiny Cars seem to look better with OSA on though. To improve the rendering quality without using an external rendering engine, it's better to use Ambient Occlusion. On the other hand, you can move the cars to another layer and render them separately with OSA. @vilvoh wow, you've got by far the highest Postcount on this Board. Congratulations! Maybe a little to small after all, but not badly. Oh boy, that Word again. Please tell me, what exactly do you all mean by 'Pavement'? From what my Dictionary tells me(never heard/read it before), it's the walkway aside the Road. I guess it means just any not empty place on the ground not occupied with roads/water etc. Back on topic, I think the hexagonal ground texture (pavement) could be improved, maybe as simple as making the texture smaller. This is the texture I use for roads / courtyards / parking areas, it's based on Raven/Rojo's roads, only slightly edited. I'd agree with The Hood - make the hexagons smaller and it will be better. In fact, what I tried to say before was just that - make the texture smaller. It seems I failed Also note that aliasing means strange things happen to detail smaller than a pixel, so one can't even tell from first images if the original texture was good or bad - just that it was made look bad in that particular image. @Fabio Thanks, i'll try it. @VS I've been trying to scale that texture down(through Settings in Blender) even prior to first Preview and the result was horrible. Took a closer look at it and found the reason in wrong cut and ratio of the Imagefile used. Had not much time, so Trucks are still untouched. Tried to optimize the OSA-Settings and scaled down the Hexagons. It seems to be the smallest useable size. Well, to be honest, there was pretty much no progress since my last post. In the last few Days StarTrek Online has consumed my free time completely. I still want to get this done, so, what is missing? Snow-Version? Or does pavement or anything else definately needs some improvement? Oh yeah, the Trucks, almost forgot. I'll make some Improvements there, got a few Days off. Edit: trying to make some snow, Trucks been improved a little too. It looks better, really. The thinner roof also helps.